If we step out of the box of conventional germ theory in which every disease has one cause, just as Dr. Moulden did, then it is possible to begin seeing this whole set of illnesses as a single syndrome. This also means that treating the underlying cause of the entire spectrum of illnesses that make up the syndrome can be thought of in a unified manner. Dr. Moulden was looking deeply into the causes of modern syndromes and diseases. He was developing treatments that had the potential for curing modern illnesses such as autism, Alzheimer’s, learning disabilities, chronic fatigue, Gulf War Syndrome, etc. His non-pharmaceutical cures were inexpensive. This provoked the pharmaceutical industry and the associations of allopathic physicians to react strongly against him and his research. He was seeing something important, and the dominant parts of the healthcare system did not want people to find out about it. Physicians no longer receive education about zeta potential and colloidal chemistry, yet it was doctors who were the main researchers in this field through the mid-1940s. This medical knowledge eventually fell through the cracks. However, with the help of Dr. Frank Hartman, Andrew Moulden was able to apply it to the understanding of vaccine damage. In a statement made by Dr. Hartman in the Tolerance Lost video series, he explained that Zeta potential and colloidal chemistry are essential for understanding the activity of blood. Colloidal chemistry is a very well documented science, but there are very few people in this branch of science who are physicians or who are researching health. Medical researchers could be using this science to look at the causes of illness and to find solutions that actually cure diseases. It opened the door for Dr. Moulden so that he could go beyond the use of pharmaceutical drugs for treating the symptoms of disease, and search for real cures. This article will discuss Zeta potential and colloidal chemistry. These concepts will help us understand how vaccines cause damage and illness. In the previous article I provided biographical information about Dr. Andrew Moulden, the man and his life. I discussed why the germ theory of illness alone is not able to explain the epidemic of modern neurodevelopmental illnesses that plague us today. I described the attack on Dr. Moulden’s credibility and how the medical system silenced him. Zeta Potential is the first of two key mechanisms, which Dr. Moulden used to describe the process that results in vaccine damage. The next article will describe the second mechanism, which is Moulden Anoxia Spectrum Syndromes (MASS). The fourth article will describe the techniques that can be used to detect vaccine damage by evaluating the functioning of the cranial nerves. I am summarizing Dr. Moulden’s teaching with the hope that it will help a new generation of people wake up to the widespread occurrence of vaccine damage and vaccine related illnesses. I will be relying on the Tolerance Lost video series that Dr. Moulden produced in 2009. In it, he graphically describes the problem that we face in the vaccine age and encourages us to preserve our health by avoiding vaccine use. I have also used a few transcripts from interviews and have relied on information from three chapters of an unfinished book that he was writing. These articles are written as a summary of Dr. Moulden’s work. Thus, I will not be using quotations. If you wish to have additional information and wish to see the hundreds of photos that are available to illustrate this information, then please watch the Tolerance Lost video series on YouTube. Transcripts of the videos are also available on line. In order for me to describe the key principles of Dr. Moulden’s understanding of how modern neurodevelopmental diseases develop, it is necessary to have basic familiarity with blood physiology and the structure of the vascular system that carries blood throughout the body. I will provide the necessary information about blood flow, blood clotting, and the damage that results from stroke and oxygen deprivation, to help us to understand the epidemic of neurodevelopmental disorders that we are seeing all around us today. This will not be a highly scientific presentation, because only a basic understanding of this information is needed to understand what Dr. Moulden taught. Blood vessels are like one way streets. They are tubular in shape and blood is intended to flow in only one direction. It flows from the heart through large vessels called arteries. The arteries carry oxygen-rich blood that is red in color. The arteries divide over and over again and become very small. Eventually they reach the smallest tubes, which are called capillaries. The capillaries are so small that they cannot be seen with the human eye. Even though capillaries account for 95% of the blood vessels in the entire body, they only contain 5% of the circulating blood at any given time. While the blood is in the capillaries, it gives up oxygen and collects carbon dioxide and other waste products. There are 600,000 miles of capillaries in the human body. When the blood comes out of the capillaries it collects in larger vessels called veins. The blood is now blue in color, because it gave up its oxygen in the capillaries. The veins merge together to form larger and larger vessels as they carry the blue blood toward the lungs and heart. When there is a blood clot or other type of blockage in an artery or in a capillary, then the blood stops moving forward in that location. The result is that the cells and tissues in the area that should be receiving oxygen-rich blood begin to suffocate. All cells require a constant flow of fresh blood to stay alive. If the interruption of blood flow and the subsequent lack of oxygen are prolonged, then cells begin to die. The technical name for lack of oxygen in a group of cells is called ischemia. When ischemia happens in the brain, it is called a stroke. A stroke is most commonly thought of as happening in the brain, but a stroke can happen in any organ of the body. A heart attack involves blockage of a blood vessel that supplies oxygen to the heart. Ischemia in the heart is a stroke to the heart. It is a serious life threatening condition. Ischemia in the bowel is also a stroke. Strokes can happen in the blood supply to the large intestine or the small intestine. A stroke to the bowel is mesenteric ischemia. Ischemia can occur in the kidneys, liver, skin, and anywhere in the body. Every part of the human body requires blood flow and a constant supply of oxygen to maintain life. Without oxygen we cannot maintain health and wellness. When the brain is deprived of oxygen even for a few minutes we become unconscious and the brain begins to die after 4 minutes. 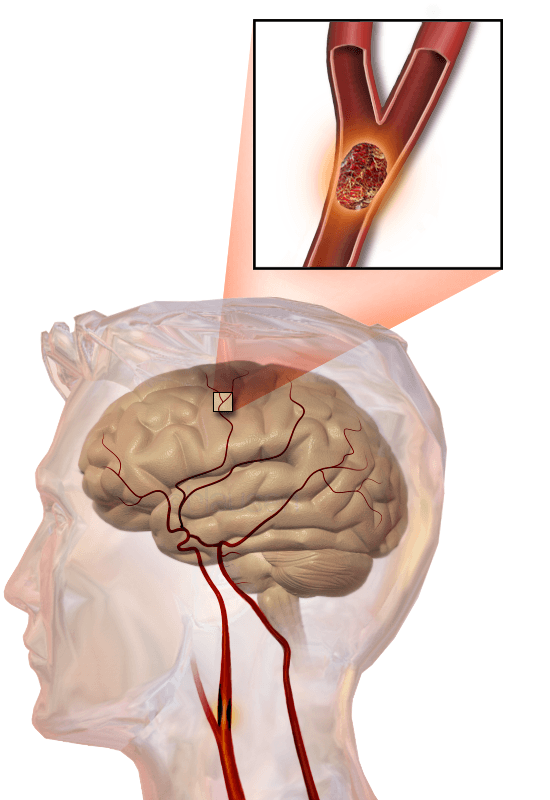 Illustration of an embolic stroke, showing a blockage lodged in a blood vessel. Source: Wikimedia. Watershed areas are very tiny sections of tissue (group of cells) that are only served by a single blood vessel (capillary). In other tissue areas, there may be several blood vessels that supply oxygen-rich red blood directly to the same cells. There also can be collateral blood vessels that move between small areas of tissue. In these tissues with multiple sources of oxygen-rich blood, there can be a stroke (blockage) to one blood vessel, but the section of tissue is not harmed, because oxygen-rich blood can reach the cells through alternative routes. In the situation of a watershed area, there is only one pipeline of oxygen-rich blood to the area. If the pipeline gets blocked, then there is absolutely no other way for the cells in that area to obtain oxygen. The result is that the cells begin to die unless the blood flow is restored quickly. Eventually, the whole watershed area could die. Watershed areas may literally have a bend or kink in the capillaries where the blood changes direction and begins its return journey to the heart and lungs. This is seen at the tips of the toes and fingers. It is seen at the tip of the nose and the tips of the ears. The watershed areas are vulnerable areas. Frostbite is common in each of these watershed areas, because the blood flow in the capillaries is very sensitive, and it is easy to disturb. Watershed areas are also present in the brain and in other organs. These are highly sensitive areas. In the brain, watershed areas are often in areas that control critical processes. An example of watershed damage in the brain is seen in transcortical motor aphasia, which involves the area of the brain that enables us to produce speech. A person with this type of watershed damage may be able to understand speech, but he will have lost the ability to form speech once there has been brain damage. We call this type of damage a stroke when we see it in elderly persons. However this same watershed damage, when it appears in a young child is not called a stroke, but is simply labelled as an autism spectrum disorder. Regardless of whether the person is young or old, transcortical motor aphasia is always caused by a stroke and cellular death in a specific watershed area of the brain. 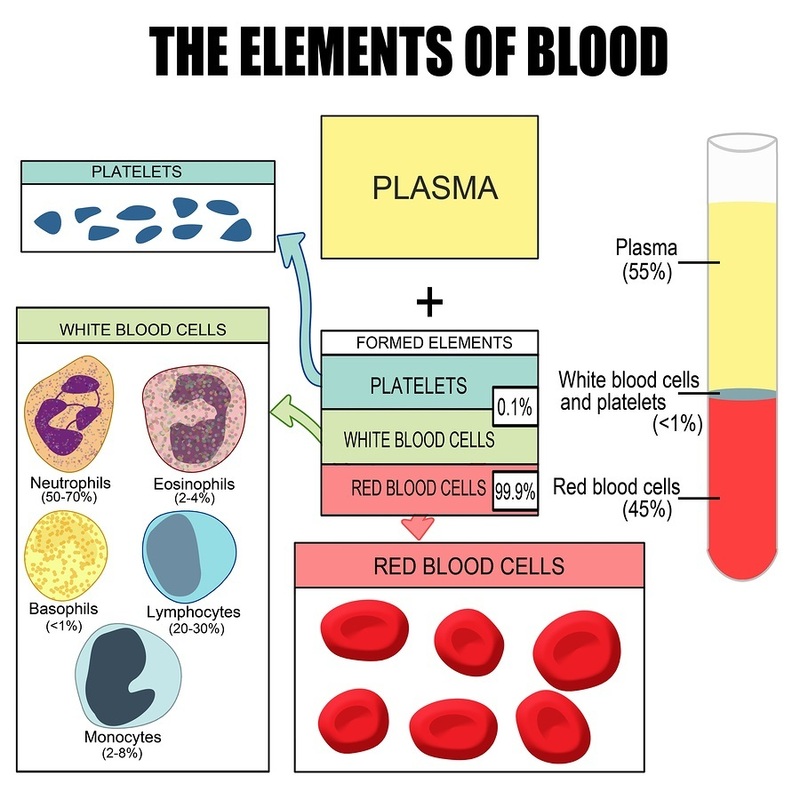 There are many components of human blood. However, to understand Dr. Moulden’s teaching, we only need to have basic knowledge of the most common aspects of blood physiology. The majority of our blood is made up of an electrically charged watery substance called plasma. Various types of cells are suspended in the watery plasma. 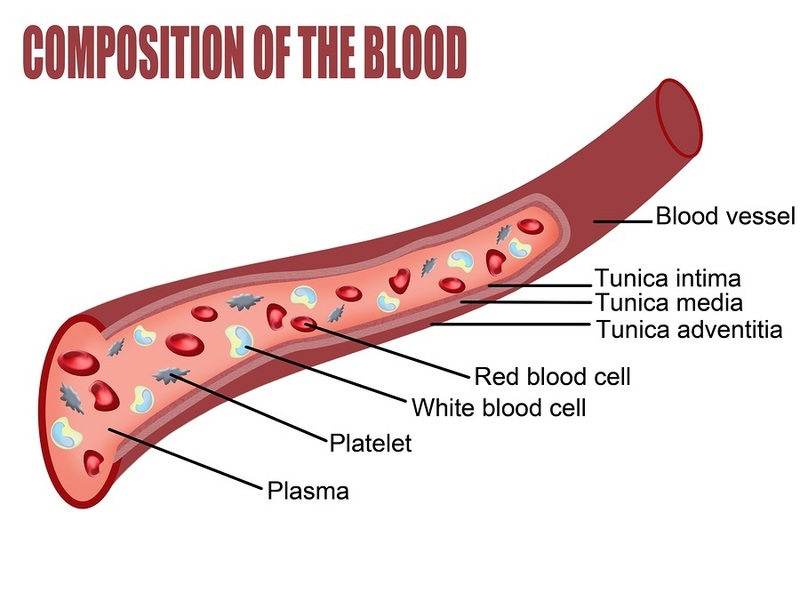 The blood cells are carried along in the plasma from one part of the body to the next. If there is a high negative electrical charge in the plasma, then the cells that are suspended in the water will repel one another. Blood cells are intended to repel each other and to move freely without touching one another. Blood with a healthy high negative electrical charge will enable cells in the plasma to flow freely without clumping together. The blood cells flow freely because they have a negative electrical charge that enables them to repel one another and stay separate. Freely flowing blood is called laminar flow. Blood that has an inadequate electrical charge will have blood cells that clump and stick together. The clumping of blood cells slows down blood flow and results in blood sludging in which laminar flow has been lost. The most common cells in the blood are red blood cells. During their journey through the body, they carry oxygen to the capillaries and they carry away carbon dioxide. Some of the capillaries are so small that red blood cells must squeeze to pass through them. In the capillaries, red blood cells must pass through the vessels in a single file stream. White blood cells are part of the immune system, which is intended to destroy invading pathogens such as viruses and bacteria. Most white blood cells are much larger than red blood cells, and they can only pass through larger capillaries. White blood cells are approximately twice as large as red blood cells, though they vary in size depending on the cell type. Under normal circumstances, approximately 1% of the cells that are floating in the blood stream are white blood cells. When the body is threatened by foreign substances or pathogens, then large numbers of white blood cells are released into the blood stream. When a person receives a vaccine, white blood cells are released as part of the immune system response to the injection of foreign material into the body. If there are too many white blood cells in circulation, then they can block the opening to large numbers of the smallest capillaries, which are not large enough for them to pass through. When this happens, oxygen delivery can be impaired to watershed areas. Platelets are a third type of cell. They help with clotting when there is damage to tissues, and blood begins to leak out of the blood vessels. Platelets are about one fifth of the size of red blood cells. Historically, Dr. Rudolf Virchow has been given credit for discovering pulmonary embolisms or blood clots, which form in the veins of the leg and pass into the lung where they cause damage. Dr. Virchow’s understanding of blood flow, blood clotting, and damage to blood flow is very critical for understanding human disease. Virchow’s Triad, as it is now called, is the beginning point for understanding the entire epidemic of neurodevelopmental disorders that are the consequence of vaccinations. Dr. Moulden’s work is an extension of this triad. Dr. Virchow described three processes that impair the supply of blood to the cells of the body. These processes result in the formation of blood clots and/or blood sludging. Blood clots are blockages in blood vessels, which can be thought of as plugs in a pipe. Blood sludging can be thought of as a problem of coagulation. Blood sludging slows down the flow of blood, which can also cause cell starvation, because the rate of flow is too low to support healthy cellular respiration.Dr. Virchow died in 1902 and since that time additional mechanisms of blood clotting and sludging have been discovered. However, the beginning point for understanding blood flow and how it is impaired rests on Virchow’s Triad. Two additional mechanisms that impair blood flow were described by Dr. Hartman and Dr. Moulden. These new mechanisms called Zeta and MASS will be discussed after Virchow’s Triad. Zeta and MASS are the keys to understanding Dr. Moulden’s model of modern illness. Each of the three factors in Virchow’s Triad increases the tendency to form blood clots. The clots formed may be large or microscopic. If blood clots occupy greater than 75% of the inside diameter of a blood vessel, then oxygen delivery is impaired and the risk for stroke is increased. Ischemic stroke is a generic term which connotes oxygen demand exceeding oxygen supply and can happen ANYWHERE in the body and not just the brain. Alterations in normal blood flow refers to several situations. These include turbulence in blood flow, stasis (low forward blood flow and pooling), blocked flow (clots), and varicose veins. Normal blood flow is called laminar flow. Dr. Moulden found that laminar blood flow was altered by vaccinations, infectious diseases, toxins, heavy metals, food additives, and drugs to which a person is immunologically hypersensitive. Stasis is an alteration in normal blood flow. It describes a condition where blood pools in the blood vessels and clots can form. A classic example of this happens when a person sits during a plane flight for a long time. When we do this, the vessels to the back of the leg can be blocked off, which prevents normal blood flow up from the legs. A blood clot can form at the location of the compressed blood vessels. Sometimes when people leave the plane at the end of their flight, a clot will break off from the compressed area and will go into the lungs and form a pulmonary embolism (plug). This type of large blood clot can be life threatening. Stasis can occur in large blood vessels such as those in the legs. It can be in medium to large vessels like the carotid arteries that carry blood up the neck to the brain, or it can happen in the capillaries, which are the tiniest of all blood vessels. Stasis is a normal occurrence in our bodies. It happens during every day of our lives. In fact, it commonly occurs in the smallest blood vessels in every part of the body many times a day. Since these clots are the result of the body’s normal functioning, the body has the means to remove the impairments so the blood can keep flowing smoothly. Blood clotting is part of the mechanism that the body uses to bring about healing to damaged tissue. Damage to the inner layer of cells in our blood vessels also causes impaired blood flow. The innermost layer of cells inside of blood vessels is called the vascular endothelium. This thin layer of cells lines all the blood vessels throughout the body. Under a microscope, we can see that the vascular endothelium consists of tiny cells that are tightly packed together similar to the scales on a fish. They line up side by side and form a complete tube through which the blood flows. The capillary tubes are somewhat flexible, and can stretch as red blood cells pass through them. Injuries and/or trauma to the endothelium can be caused by damage to the vessels arising from stress, hypertension, ischemia, toxins, metabolic derailments, and immune system responses to foreign substances that are in the blood, in tissue, or in the blood vessel walls themselves. Vaccines can cause endothelial damage. When there is an injury to the inside lining of blood vessel walls, we call that endothelial damage or damage to the vascular endothelium. When the vascular endothelium is damaged, this can lead to clotting or coagulation in that area. The third way that clots can develop and tissues can become starved for oxygen involves changes in the constitution of the blood. The blood can develop a tendency to clot even when there are no alterations in blood flow, and when there is no endothelial damage to the lining of blood vessels. Blood that has an abnormal tendency to clot means that that the blood has become hypercoagulable. This means there is too much clotting going on in the blood and in the body. Another term that Dr. Moulden used to describe hypercoagulable blood is sludging of the blood. Sludging of the blood can be caused by vaccines and various environmental factors. We can decrease blood sludging by reducing our environmental exposure to toxins and by changing our lifestyle. The weakening of zeta potential in the blood also causes strokes. Zeta is an electrical charge that exists around all particles in the blood. The negative electrical fields cause particles, substances, and cells in the blood to repel one another. As an example, if you take the negative ends of two magnets and try to push them together, they will repel each other. In the same way, if all blood cells have a high negative charge, then they will repel one another and move freely through the blood vessels without touching one another. This independent movement of cells in the blood is a mark of health. When the strong negative electrical charge on blood cells is lost, then the cells start clumping together. This is seen when the electrical charge is very low or neutral. This leads to poor health and disease. If an infant is born without having been exposed to the toxins and diseases of this world, then the baby’s blood cells will not stick together, because the normal high negative electrical charge on blood cells will keep them all separated. The cells will move freely as they were designed to move. They move in a suspended state, which is called colloidal suspension. When there is proper colloidal suspension, blood cells move smoothly through the smallest blood vessels. The blood flow is laminar – it flows without restriction. As soon as the electrostatic charge around these particles in the blood drops toward neutral, then the particles start clumping together. This forms clots and concretions of particles. It’s hard to move concretions through small pipes that were designed to only allow one red blood cell to pass through at a time. Examples of a stable and of an unstable colloidal suspension. The continuous phase is a liquid and the dispersed phase consists of solid particles. Source: Wikimedia. In chemistry and physics we call this electrical charge “valence.” It is the outer electrical charge around particles. From the point of view of human health and wellness, it is extremely important to avoid the blood sludging problem, because it causes serious health problems. It is important for cells in the blood to have more of a negative electrical charge and not a positive charge. Blood with a positive charge leads to clumping and coagulation. Blood with a high negative charge causes dispersion, keeps things apart and prevents clumping and coagulation. For example, the dust particles that are floating in the air of a room on a bright sunny day are held up in the air and enabled to float by their high negative charge. It is this negative charge that keeps them suspended in the air and keeps them from coming together. The molecules, particles, suspensoids, and cells inside of the blood will act like dust in the air when they have a negative charge. The red blood cells carry the electrical charge that is life. The red blood cells are the main carrier. The amino acids, protein, trace minerals, metals, and minerals don’t go into solution like sugar and water. They are held in suspension as minute colloids (tiny particles) , which start at a size of one micron and go down to as small as six angstroms. The following chart shows how zeta potential affects the blood and how it affects human health. A high negative charge is associated with laminar blood flow and overall general good health. Extreme to very good stability -100 to -60 mv. Reasonable stability -60 to -40 mv. Moderate stability -40 to -30 mv. Threshold of light dispersion -30 to -15 mv. Threshold of Agglomeration -15 to -10 mv. When the red blood cells start losing zeta potential they start to form rouleau. This means that the negative electrical charge around them, which had been keeping cells separated from one another, has decreased and the cells are sticking together. The term “rouleau” describes a situation in which red blood cells clump up or stack up like coins. When rouleau is present, smoothly moving laminar blood flow is compromised. The result is sludging of the blood, hypoxia (low oxygen supply) and strokes. These clumps of cells are not able to pass through most capillaries, because they’re too big, especially at points where the blood vessels turn and change directions – especially at a 90 degree turn. Rouleau is visible under darkfield live blood microscopic examination. Unfortunately, the US FDA has banned the use of darkfield live blood analysis for diagnostic purposes. This means that they don’t want anyone to do before-and-after comparisons of the blood to see what happens after vaccines are taken. One of the areas in the body that is hard hit by reduced zeta potential is the gastrointestinal tract. Reduced capillary flow in the digestive system results in damaged digestion, diseased tissue and numerous abnormal digestive syndromes and diseases. The reduced flow of blood means that white blood cells cannot get to certain areas and eradicate viruses and bacteria that your body needs to destroy, such as measles, mumps, and rubella. The consequence is that the body cannot eliminate these infectious diseases from the digestive tract. This leaves the body in a state of perpetual infection. The body can’t get rid of these infectious diseases, because the impaired blood flow prevents the immune system from reaching the pathogens to destroy them. If blood flow is blocked to an area, then the white blood cells cannot reach the pathogens that have taken up residence in that area even if the number of white blood cells is elevated. 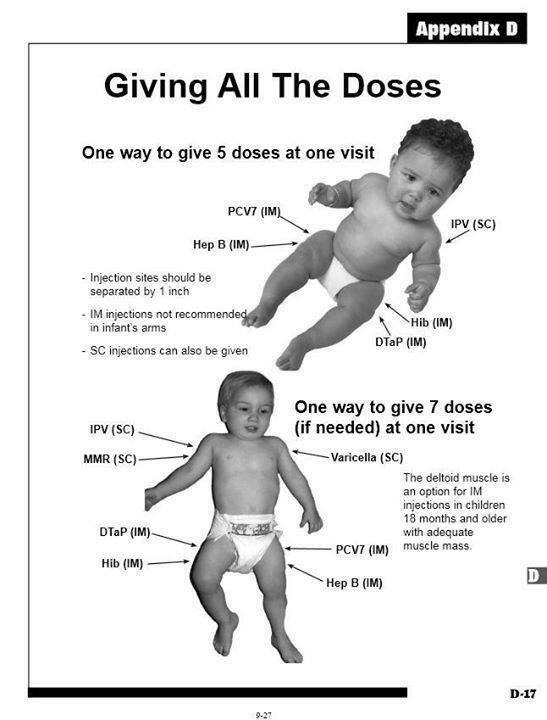 Page from a medical manual showing how to administer multiple vaccines in one doctor visit. Vaccines are the straw that breaks the camel’s back when it comes to the destruction of zeta potential. Vaccines contain everything in one package that is needed to reduce zeta potential in the blood and set up conditions in the body where all manner of modern diseases can develop. Vaccines contain a combination of infectious pathogens, aluminum, mercury, aborted fetal tissue, genetic materials from animals such as monkeys, preservatives, formaldehyde, and numerous other toxic substances. The ingredients in vaccines can cause clumping of blood cells, impaired blood flow, ischemia, cell death, and impaired immune system functioning without any other type of exposure. Vaccines contain everything that is needed to destroy laminar blood flow, cause clotting and sludging of the blood, deprive cells of oxygen, bring about cellular death, cause neurological damage, cause organ system damage, and lead to severe disability and death. Thus, vaccination of the elderly, or those with hypercoagulable states, may reduce zeta potential to the tipping point where even an emotional upset can trigger a microvascular clot in the brain (stroke) – or a heart attack. The next article in this series will provide additional information about the harmful effects of aluminum in the context of Moulden Anoxia Spectrum Syndrome. Zeta potential can be used as an indicator of health. High negative zeta in the range of -100 millivolts to -60 millivolts is associated with strong colloidal suspensions. Blood cells and other colloidal particles are widely separated and do not clump together. This provides for laminar blood flow, in which there is reduced likelihood of blood sludging and blood clotting. Sludging and clotting can be caused by other factors, but when negative zeta is high, then one major factor for sludging and clotting is greatly reduced and overall health will be high. When vaccines are given or when other environmental toxins are brought into the body, then negative zeta falls. Repeated exposure to vaccines and environmental toxins will over time push down negative zeta toward the positive range. If the zeta falls to the range of -30 millivolts to -15 millivolts, then the cells and particles in blood start coming close to one another. If the zeta is in the range of -15 millivolts to -10 millivolts, then blood clumping and sludging is already occurring. If a vaccine is taken at this point, then it has the potential of driving down zeta toward neutral, where intense blood sludging is possible. This can lead to microvascular strokes and anoxia in which certain watershed areas of the body can become starved for oxygen. Each time a vaccine is taken, it reduces negative zeta potential. Since good health is associated with a relatively wide range of negative zeta, a single dose of vaccine may not produce immediate or noticeable harm, as long as negative zeta remains in the high range. But aluminum collects in the body and is not easily excreted, which means that aluminum from vaccines continues to push down zeta toward the point where harm can occur. Vaccine damage is not predictable. Many factors determine the impact on zeta and the severity of damage that will be caused by taking vaccines. We do not have a formula to estimate how much damage to zeta will be produced by a single dose of vaccine. We know that the aluminum in vaccines is a powerful agent, which draws down zeta toward neutral. In the next article I will discuss the second key to understanding how vaccine damage occurs. It will discuss Moulden Anoxia Spectrum Syndromes (MASS), and explain how Zeta and MASS work together to bring about illness. Finally, the fourth article will discuss the system of noninvasive methods that can be used by anyone to identify when vaccine damage has occurred.